Insert SIM card on Nokia 6280 can caused by several reason, but most often occur problem caused by damaged SIM card driver. The SIM card driver is a little IC and it broken easily. To repair this problem, you can replace or make a jumper to that driver. 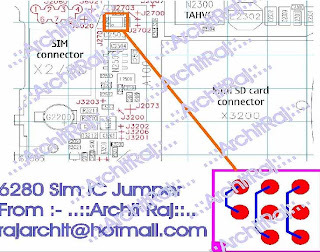 Here, mobile repair have a picture related to Nokia 6280 insert sim card problem, this picture show you the location of the keypad ic and how to make the jumper.